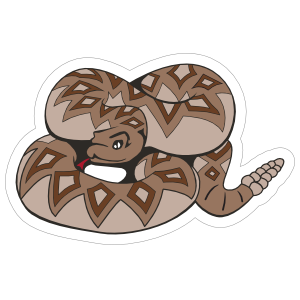 Perfect for any car or window, our Diamondback Rattlesnake Mascot Sticker is printed on high quality vinyl with a vibrant print that lasts up to 5 years. The Diamondback Rattlesnake Mascot Sticker can be personalized by adjusting colors, size, text and other features. Customize your car or home with our long lasting stickers. Personalize your Diamondback Rattlesnake Mascot Sticker and order online today!